Equipped with two diaphragms per channel, these Dual Stereo Headphones from Zalman offer a sound that's worlds apart from your average set of ear buds. Working in a similar fashion as a 2-Way speaker, the smaller of the diaphragms functions as the tweeter while the larger diaphragm behind it functions as a woofer. 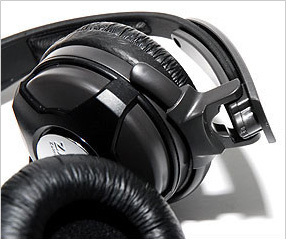 Optimized for enhanced performance of your MP3 or portable music player, these Zalman Headphones provide strengthened mid and low sounds, deep bass, and clear highs. Basically, it's like having a miniature sound system that plugs directly into your brain (which sounds a little creepy, but in a cool "futuristic" sort-of way).